Arrecife 23/24/25 make up a luxurious estate with resort amenities like a full staff, beautiful landscaping, pristine pools, and glamorous design. Each villa has flatscreen TVs, a fully equipped kitchen, and ensuite bedrooms. Punta Cana is one of the most gorgeous parts of the island, and you won’t be short on activity. Large luxury villa where the more the merrier! 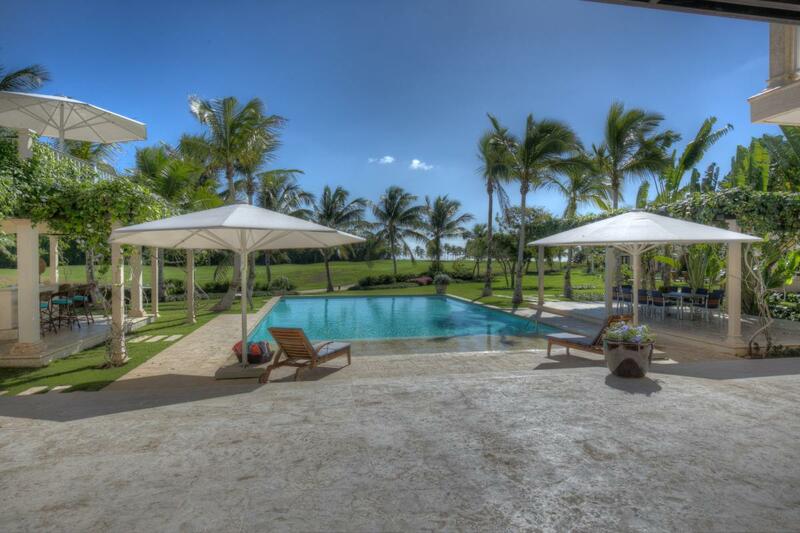 Arrecife Estate offers 13 bedrooms between three Punta Cana Resort villas. Each of the villas, Arrecife 23, 24 and 25, are totally independent and have garden access to each other. All three villas have an infinity pool with a wading area. Each villa also has its own staff, kitchen, and lounging deck. The estate is staffed with three housekeepers, two waiters, a chef with two assistants. Arrecife 23 has an unheated jacuzzi tub, and its galleries wrap around the property. A granite bar with seating surrounds the large, stainless steel BBQ grill, and al fresco dining sits nearby. An al fresco living area combines shade, ceiling fans, and fresh air amongst lush gardens. Wooden French doors lead into the common areas, which are opulently decorated and furnished. Indoor fountains, a flatscreen TV, and wrought iron accents add luxury. Twelve can sit around the dining table in the gourmet kitchen, which is equipped with luxury-range, stainless steel appliances. Three of its suites have king beds, and the fourth suite has two queens and one twin. Each of the suites is extremely spacious and features an ensuite bathroom. Arrecife 24’s large pool deck features a wading area and several loungers. An arched gallery with seating lines the pool and lush lawn. French doors lead into the colorful, soothing entryway and the dining room. The living room also has exterior access, and is furnished with a bookshelf, flatscreen TV, and breakfast nook. The gourmet kitchen is equipped with stainless steel appliances, a gas stove, and bartop dining. All four bedrooms offer a flatscreen TV, ensuite bathroom, and exterior access. The master suite offers a king bed and a large sitting area, and the other king suite has a loveseat. The remaining bedrooms each have two double beds. Arrecife 25 is a lush garden retreat, with a large pool and abundant greenery. There are loungers and dining in the sun and shade, as well as a hammock between two palm trees. A marbled wet bar wraps around the gazebo, and French doors lead inside the impressive two-story villa. A glamorous chandelier hangs over the living room, and there’s several places to sit and relax. A wrought iron railing borders the upper level gallery, which overlooks the common area. The warm kitchen has stainless steel appliances and a dining table. There’s also a formal dining room that seats 12. All five bedrooms are upstairs, and each has balcony access, an ensuite bathroom, and a flatscreen TV. Four suites have king beds, and one has two double beds. One of the king suites also has a Jacuzzi tub. Arrecife Estate is located in the Punta Cana Resort & Club, and has all the amenities one can expect from a luxury resort villa. It’s coral reefs, calm waters, and white sand beaches showcase the best of Dominican Republic. This villa is 18 minute walk / 4 minute golf cart ride to both Playa Blanca and Clubhouse Beaches. Car rental, grocery and beverage shopping (pre-arrival and during your stay), liquor and wine delivery, nanny service, baby equipment, spa services, yoga and personal training, and photography can be arranged for an additional fee. Golf cart rentals start at $60/day and bicycle rentals start at $20/day.